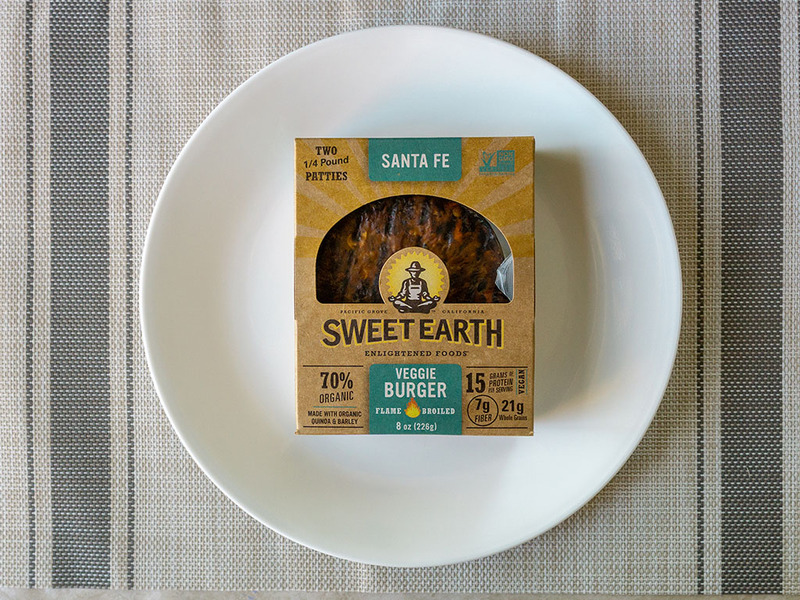 Are Sweet Earth Sante Fe Veggie Burger any good? 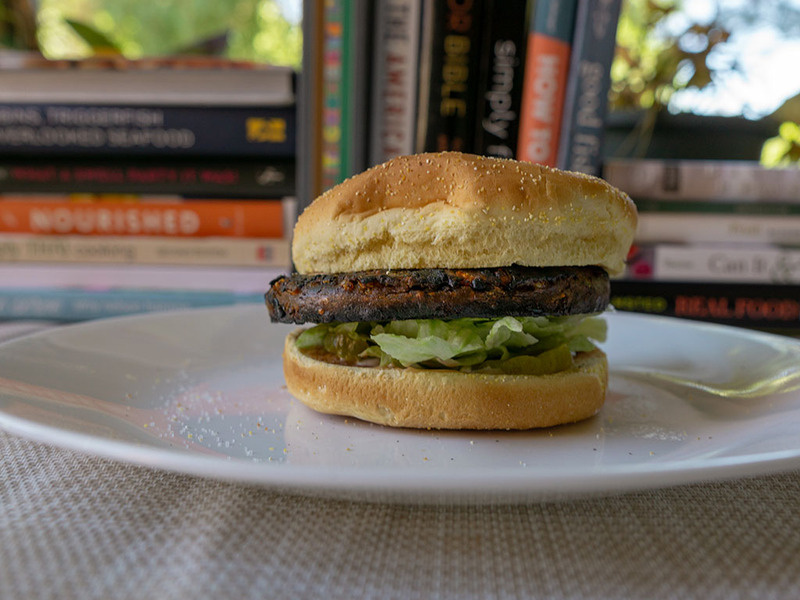 These are a fairly run of the mill black bean burger. 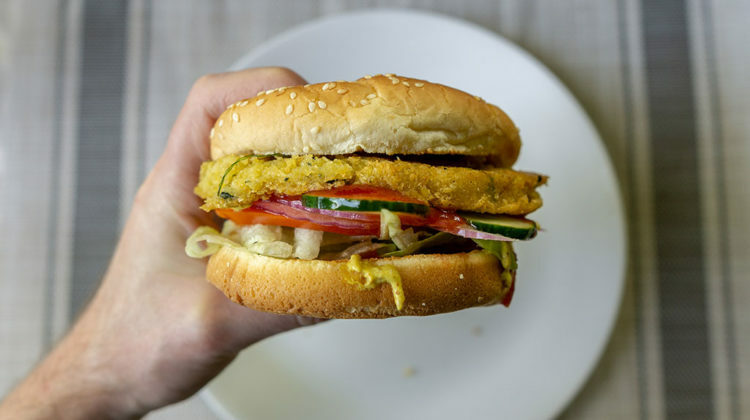 If you like the taste and texture of a typical patty of this style, you’ll probably love these. They make for a very healthy choice over some of their competitors and the package is a real treat. Long time readers will know I’m a sucker for well designed packaging. Sometimes I don’t even really read what I’m buying, “hey look at this neat cardboard box, this must come home with me for sure”, boom in the cart it goes. 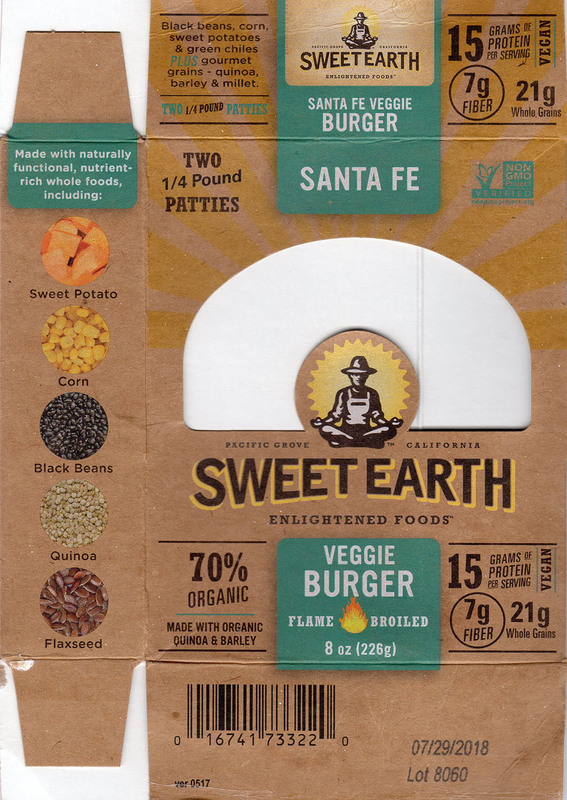 And so it went with these Sweet Earth Sante Fe Veggie burgers. Like a moth to the flame, the modern box and stylish design had me hooked. 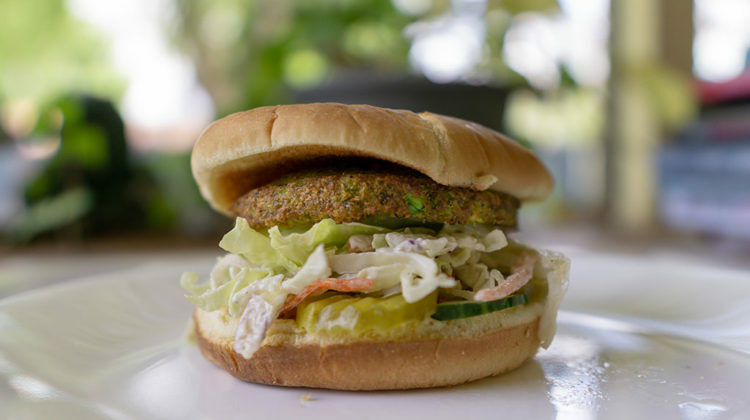 Even when I got these veggie burgers home I still wasn’t paying attention. It took me until my first bite to realize that I should have spent more time inspecting what I was buying. 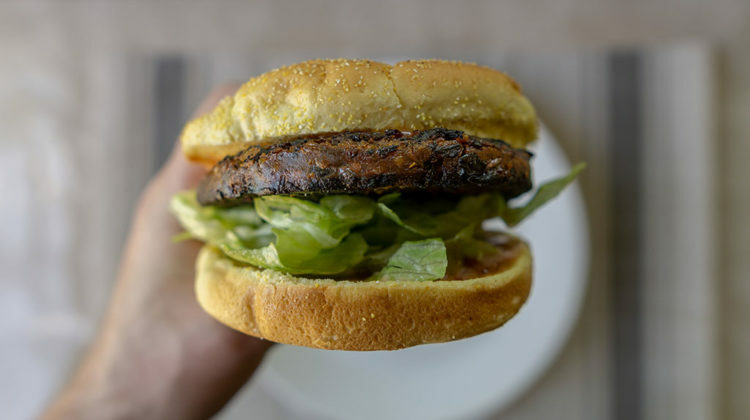 This patty is essentially a black bean burger with added corn, quinoa and flaxseed, and I was kinda expecting something different; something in the vein of a Field Roast or Beyond Burger product. 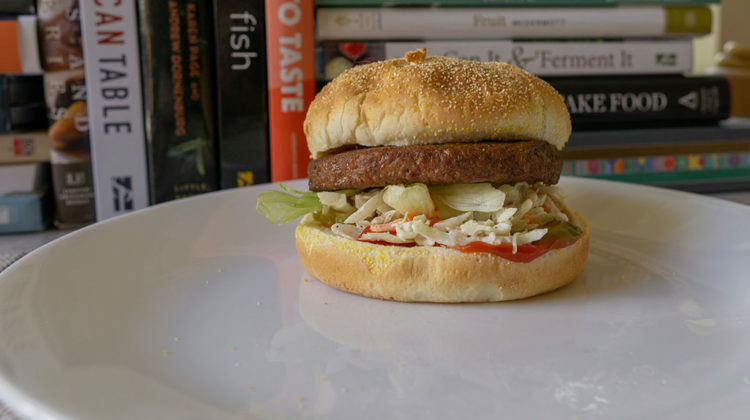 Instead, what I found is the classic black bean burger you know and love – or maybe hate. 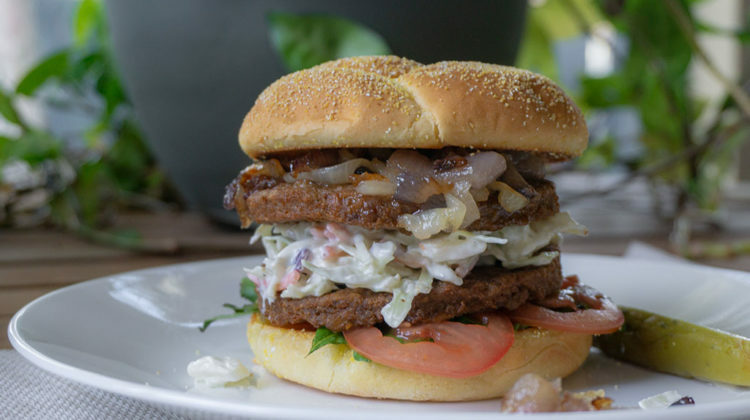 Not me, I’m a fan of a good black bean burger and this was a decent rendition. 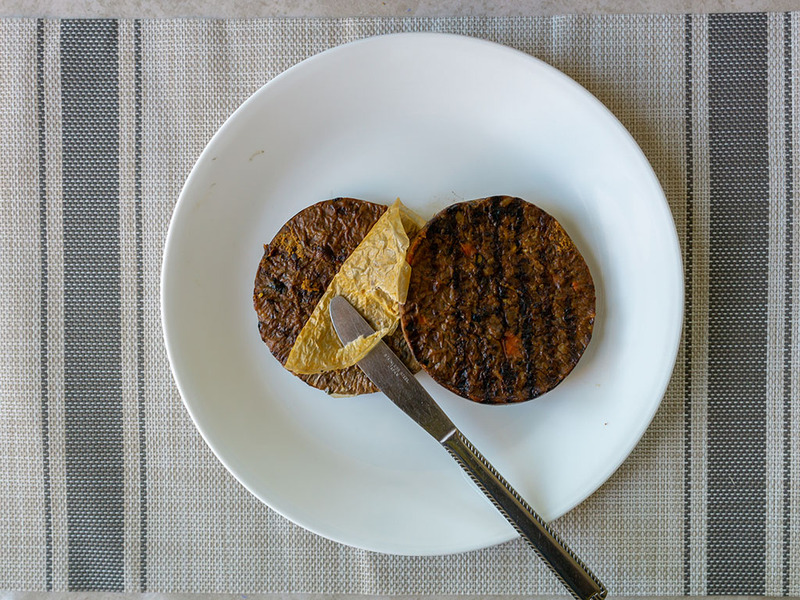 The patties have a notably strong BBQ aroma out of the plastic wrapping – most likely from the hickory smoke ingredient. 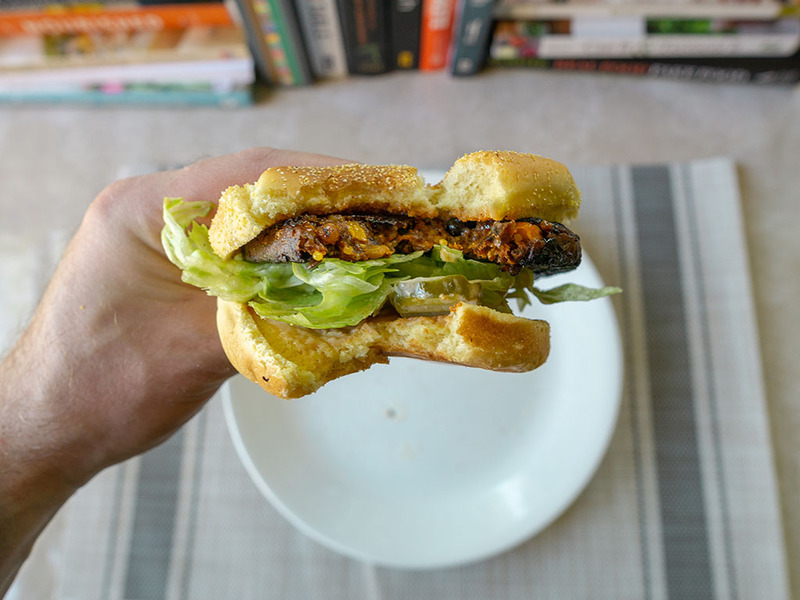 It dissipated fast during cooking though leaving a fairly recognizable black bean burger taste with a hint of Southwestern spice. 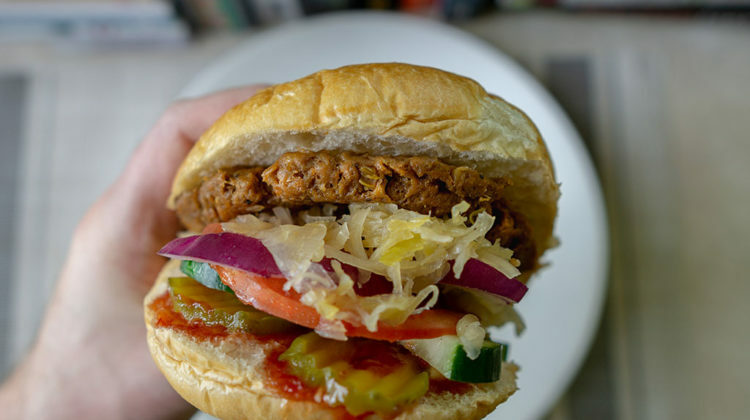 The texture too was the mushy interior / crisp exterior you’ll be familiar with from other bean burgers. If that’s you’re thing, these might be right up your alley. These didn’t blow me away, nor did they disappoint, at least beyond my own failure to read what I was buying. 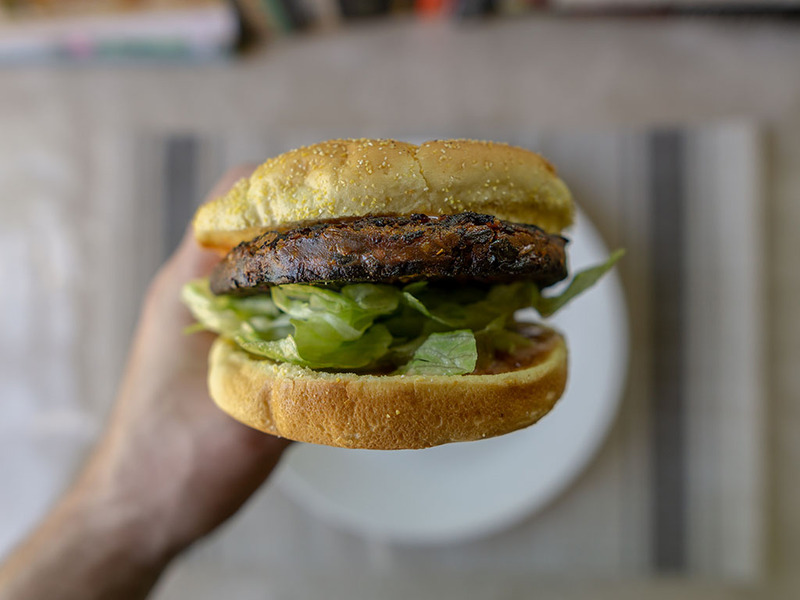 These are a completely acceptable black bean burger, and depending on your personal preferences and the price you find them for – they could be a great buy. Two patties come in the cardboard box, wrapped in shrink wrap plastic. 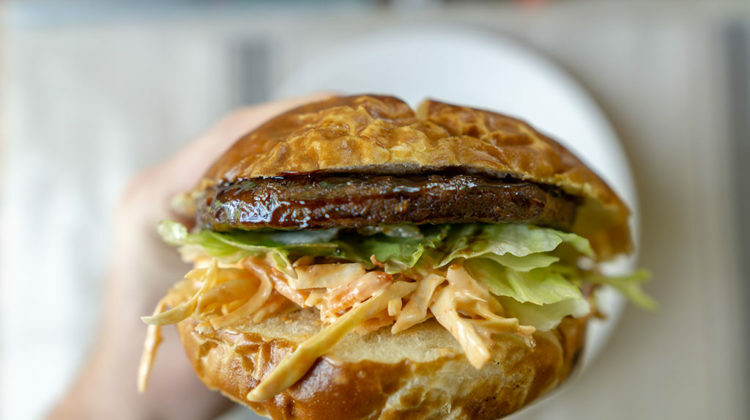 Once opened, the two patties are further separated by a little slip of paper to make pulling them apart simple. Each patty weighs 4 ounces. They have a remarkable shelf life too, mine stayed in the refrigerator for a few weeks before I remembered to dig in. 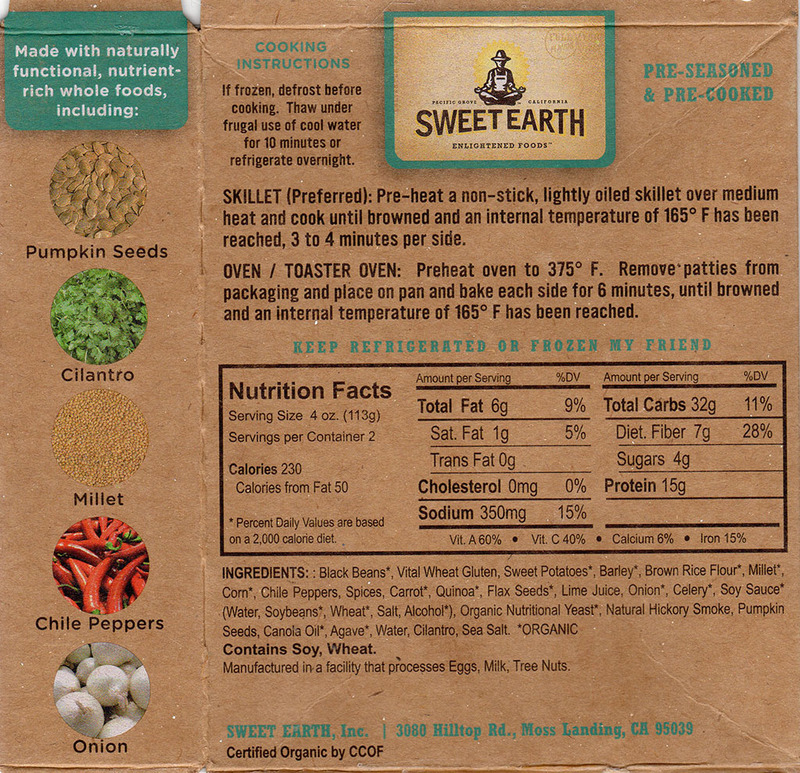 The pan or oven are the recommended methods on the packaging. 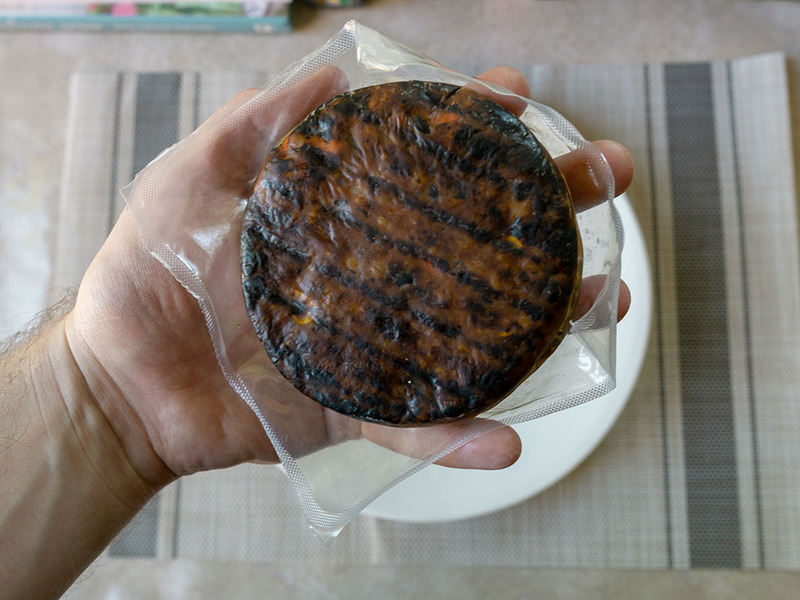 I’d concur, these patties seem a little delicate for the grill and just not the type for the microwave. I pan fried mine and found they cooked up way faster than the packaging suggested. So much so I actually charred them a little as a result, which actually added a nice extra hit of flavor. Nutritionally these are a great choice – decent fiber and protein and relatively low fat. They’re non-GMO and organic certified plus 100% vegan. 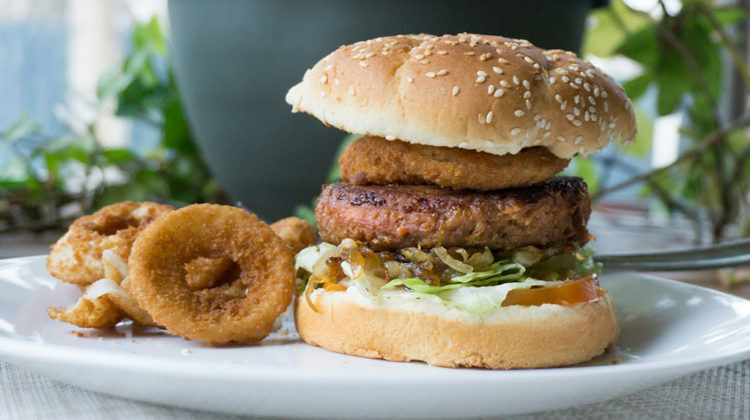 As a burger that’s clearly focused on the health aspect of its makeup – these are one of the better on the market.